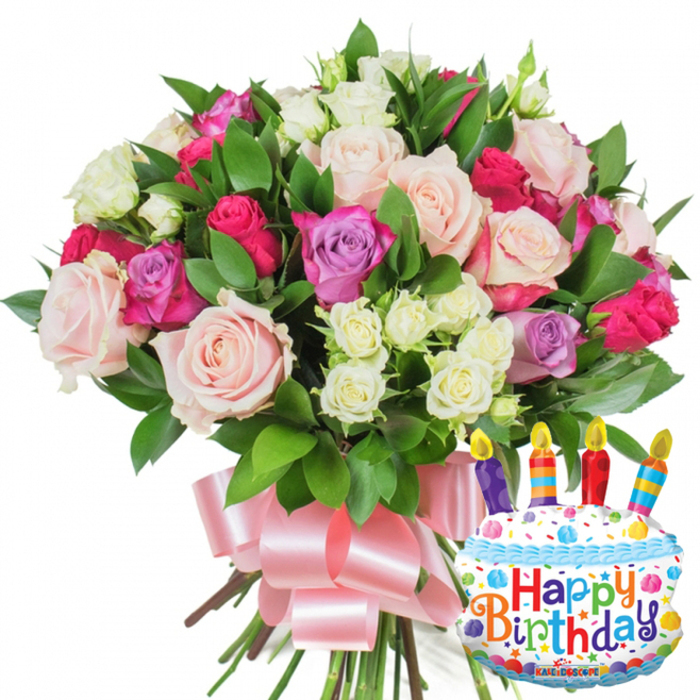 Perfect for an occasion as special as a birthday, this glamorous bouquet of roses is combined with a joyful balloon to represent your loving feelings on their special day. Spoil your loved ones with a gift that will continue to glow for days! This array of blooms is just so magical! As they are a birthday gift from mum, I plan on pressing them, and then framing them for a nice wall display, keeping a few frames for myself, and also gifting mum with some! I suggest that those of you who receive such lovely flowers yourself, to consider either drying them, or pressing and framing them, that way they'll last forever! Handsome birthday bouquet, loved the little detailing of the tied ribbon around the stems. Flowers arrived by 2pm, friend said she sent them using same day flower delivery, so that's pretty cool. Recommending. My mother's birthday was coming up and I wanted to purchase some flowers to accompany the gift I bought her. She loved the flowers and told me they were divine! I chose this flower arrangement after a lot of hunting and I'm glad I did, it's absolutely perfect! I received the flowers yesterday. Timely delivery. Thanks! The birthday girl enjoyed the gift. Big thank you for helping me surprise her. I'm in love with this bouquet! The courier came this morning and delivered the box. It was so exciting to open it and see these amazing flowers!